The chamfering tool is like taper gear, with a width of roughly 10 – 15 mm, and normally is very well finished, with a surface like a mirror in order to prevent a quickly wear . • To avoid damaging gears and bearings – If burrs are not removed, they may chip off during the running cycle and cause damage to the other gears and bearings. 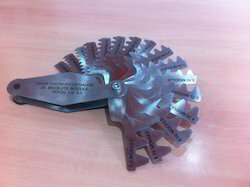 • To avoid poor tool life in the following finishing processes (see next slide) – Hardened burrs will cause shorter tool life in the following finishing processes – The build-up of material along the profile due to chamfering must be straightened in a subsequent rolling cycle. If this is not done, such build-up can reduce the life-span of the finishing tools. Gear measuring wires are used as a quick means to check the tooth thickness of gears at the pitch diameter. It is far more accurate than using gear tooth vernier calipers. Gear Pitch Gauges are used to correctly identify your gear. This gauge is made of Hardened & Tempered Stainless Steel material 0.5 mm thickness, in Diametrical Pitch for 14.5 or 20 degree Pressure Angle & in Metric Module for 20 degree Pressure Angle. cut accuracy and is made from anodized aluminum for long life. Sold in complete sets only, with carrying case. 1) Gear Tooth Pitch Gauge – Diametric Pitch 14.5º Pressure Angle; Range :- 1 DP to 80 DP. 3) Gear Tooth Pitch Gauge - Diametric Pitch 20º Pressure Angle; Range :- 6 to 80 , 22 pitches. 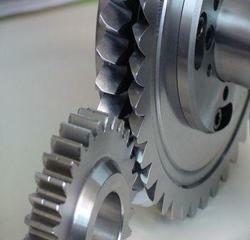 Looking for Gear Chamfering and Deburring Tools ?